The 1980s brought the computer into the workplace. Since then we've become increasingly reliant on all manner of electronic gadgets and gizmos, from printers through to coffee making machines, which are all now competing for our office floor space. One thing all these items share is a demand for electrical power, which is delivered through cables, with many computers requiring multiple connections for monitors and peripherals and in some cases ethernet cables for network communications. As such cabling has now become a vital part of office infrastructure, what are the true costs of damage and replacement? One of the biggest problems presented by loose lay cables is that they're a tripping hazard. Aside from the obvious health and safety risk here, if someone catches their foot on a cable, this can often also dislodge it from the appliance which it is powering, and if this is a computer then your business could lose valuable data. This is especially damaging if important database files are open on the machine at the time, which can become corrupted due to an unexpected shut-down. Although conventional electrical cable is robust and can probably stand years of repeated pressure this isn't the case with modern types of computer networking cables, especially those which use fibre optic technology. Many engineers say that these cables are as fragile as glass, and will not withstand even a small knock without a noticeable drop in performance. Heavy pressure, such as that created by a goods trolley's wheels, can often destroy this cable's information carrying properties completely. Also many types of computer cabling are often held in place by a very weak plastic clip. Any pressure that's put on this clip, such as a sudden jolt if the cable gets caught up a chair's caster, or on a person's foot, can very easily break it, preventing it from being properly seated in the computer or peripheral, and rendering the entire cable useless. Heavy duty electrical cables can become worn over time and the three core wires that are within the protective outer sheath can become exposed. At these times it is possible to use a temporary repair where the exposed wires are secured with insulating tape. However, this should only be used until a new cable can be sourced, as the wires underneath the insulating tape can be prone to more damage, such as cracking of their individual casings. This can in turn expose the actual copper charge carrying cores, which could result in a dangerous electrical accident. Conduct minor repairs to keep your workplace safe, but always replace with a new cable as soon as possible. One of the biggest hidden costs of damaging loose lay cables is downtime. Damaged cables, particularly those that are necessary for computer networks in an office can take time to replace. Even if you have a wireless network where all your users are connected to a hub via Wi-Fi technology, there is still a danger that the cable running from the phone socket to your router or modem could get damaged, resulting in a loss of communication across the entire office. Even though such a piece of cable may cost as little as £2 to replace physically, the money lost through downtime due to the late delivery of work, quotations and vital business communications can stretch to a whole lot more. Did you know that all power cables have their own electrical (EMF) field? If a cable passes near a metal desk, cupboard, chair or similar piece of conductive office furniture, then this can serve to amplify this field. Many health professionals believe that over-exposure to EMF fields can lead to musculoskeletal problems that are linked with RSI and may even have a part to play in cancer. By ensuring that loose lay cables are properly protected with insulated covers, you're not only protecting your appliances, but also your most valuable asset - your staff. In an ideal world all businesses would have structured ethernet cabling in their walls for computer networking and would have enough power-points to ensure that all electrical items could be powered by short cables that can be stowed out of the way of foot traffic. However, with many companies now employing free-lancers and part-time workers on a day rate, who may bring their own lap-top into work, it's becoming more difficult to have a small office environment that's built round a dedicated number of persistent office employees. However, by using the correct equipment to protect loose lay cables, you can create an office workspace that as safe for both appliances and workers as one that uses set power points and hidden cabling. The ideal solution to prevent your business incurring costs from replacing office loose lay cables is by using the proper protection. 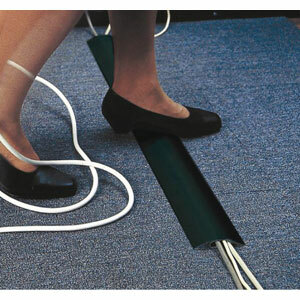 These will not only ensure that your cables are free from damage, but can also prevent workers tripping or snagging their feet, creating a safer office environment all round. It's possible to purchase heavy duty protective cable covers that can be used in areas where heavy wheeled equipment may need to be manoeuvred and insulated covers that will stop EMF radiation in your office work place. As with many things in business this may require additional up front costs, but over time you will more than recoup this initial outlay by saving your business the time and money it will take to deal with purchasing new cables and the cost of down-time.